Dwell Of Decor teeth 5 Super Easy Homemade Teeth Whitening Remedies to Get those Pearly Whites Back! 5 Super Easy Homemade Teeth Whitening Remedies to Get those Pearly Whites Back! Of course, brushing that gorgeous set of teeth to make sure our smiles stay healthy and attractive is a daily ritual. But, no matter how expensive or well-claimed your store-bought toothpastes may be, most of them are loaded with chemical substances harming those chompers in the long run. Plus, the consumption of coffee, wine, tea and soda turn the teeth a bit yellow and even the most amazing of toothpastes can’t really help it. However, some of the most basic ingredients from your kitchen when applied onto your denticles with homemade teeth whitening solutions are all you need to bring those pearly whites back! One of the major ingredients of most commercial toothpastes is baking soda – thanks to its teeth whitening action. Plus, it acts as an abrasive that scrubs away teeth stains and prevents bacterial growth. Whereas lemon features amazing bleaching properties that eliminate the yellow discoloration of your teeth. That’s why, applying a mixture of the two onto your teeth works wonders to make them sparkle all over again. To prepare the paste at home, you’ll need some baking soda, lemon juice, a cotton swab, and a glass of water. How amazingly well activated charcoal pulls the toxins out of your teeth makes it very beneficial for teeth whitening, while a super strong crystal-based chemical present in charcoal amplifies the process. But, what’s best is that you can whip up a homemade DIY teeth whitening solution of charcoal and let its porous granules bind the bacteria before it stains the teeth. The key is to blend charcoal with a little water, and gently apply it to on the teeth. Let it work for about 2 minutes, finally rinsing it with thoroughly. Those little cavities developing within your teeth is no less than a knightmare calling for a formal dentist treatment. But, what if you could get rid of such cavities and restore the damage at home? All you need to do is to brush your teeth with a magical homemade toothpaste with hydrogen peroxide sprayed on the toothbrush, accompanied by following a few quick tips to take better care of your teeth. Just a deal of 4 ingredients, including some coconut oil, mineral salt, some baking soda and a little essential oil are the secret to whipping up the mix. Not only does the yellow colored herb get rid of the yellowness in teeth, but also makes them stronger and free from toothaches or other oral problems. Use it alone or combine with a few other natural ingredients, it won’t fail to show surprising results every single time. The most effective method is to apply a fine paste of water and organic turmeric powder onto your teeth. Alternatively, you can relieve gum diseases by mixing it with coconut oil and peppermint oil. The last method is to prepare a natural, fluoride-free toothpaste of baking soda, coconut oil and turmeric. While most treatments may take a few days to yield visible results, a simple and affordable substance like activated charcoal powder can get you a gorgeous bright smile instantly. Scrubbing the powder onto your teeth with a toothbrush for about 5 minutes, before rinsing out all the black with water is all you are required to do. 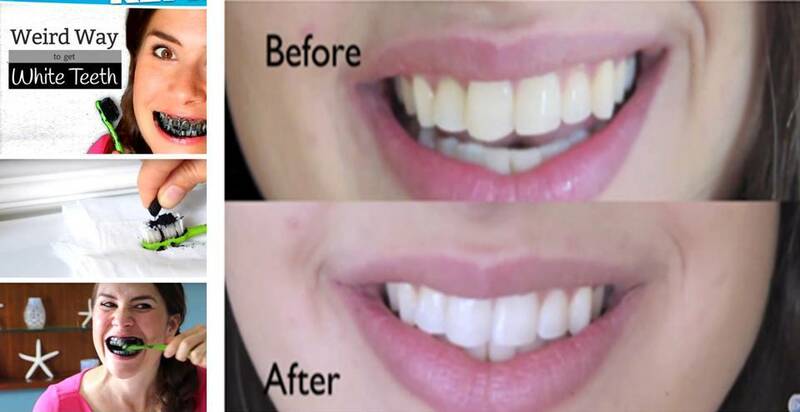 The substance actually absorbs all the bacterial accumulated over the teeth and remove any stains developed over time, letting you witness immediate whitening of your teeth, that too like no other store-bought solution can!